Finally! By Sword and Storm. Many of you will know that I began By Sword and Storm in February 2016 at Hawthornden Castle – in atmospherically chilly conditions, when the central heating broke down – it was one of the most productive months of my life. 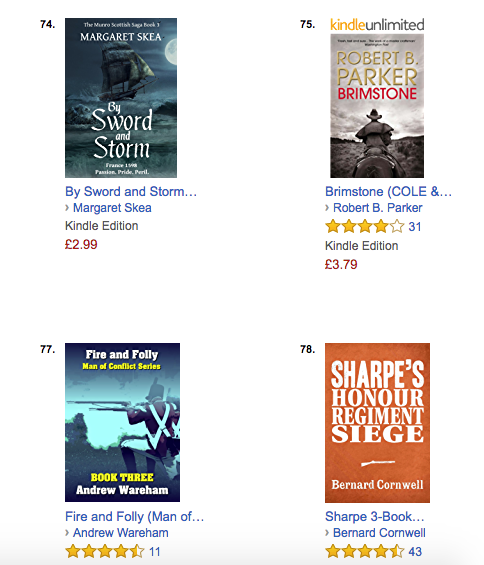 The ebook has been available for a week now – it has the publisher’s choice of cover – and I have been having a little bit of fun collecting screen shots of it sitting near or next to various Sharpe novels in the Amazon rankings. – it seems they’re placing me in good company! The print will be officially launched in September – but it’s rather nice to know that it’s already available to pre-order – the discount on the pre-order was a new and unexpected bonus. The French Wars of Religion are drawing to an end, the Edict of Nantes establishing religious freedom in all but Paris. For the exiled Adam and Kate Munro, the child Kate carries symbolizes a new life free from past troubles; despite a lingering nostalgia for Scotland and the friendship of the Montgomeries. When Adam foils an attempt on the French king’s life his reward is a place at court for the whole family. But religious tensions remain high, and Paris holds dangers as well as delights. At first it was no more than a whisper, carried on the breeze. The King is coming. A priest crossing the cathedral close heard it and, shaking his head, boxed the ear of the urchin who dared give it voice – a malicious rumour, surely, Mercoeur’s flag still fluttering above the chateau, but no less dangerous for all that. For a rumour once started could travel like flame through the city, trailing destruction in its wake. The boy, one hand clamped to the side of his head, retaliated with a well-aimed kick, before darting through the gate leading onto the Grand Rue to melt into the crowd that thronged there, his excitement undiminished. It was not rumour, not a flame; rather water, a trickle become a stream, slipping through the dense alleyways, lapping at the doors of the narrow half-timbered warren of houses jostling each other as they stretched upwards to find a sliver of sky. It gathered momentum, flowing southwards to the Rue des Jacobins and La Fosse, to the hôtels of the merchants who grew fat on the spoils of commerce. It reached the Maison de Tourelles, and the ears of André Ruiz, who, so the story went, had once entertained an emir with capons and truffles, frangipane and apricot tartlets, custards and cheeses and succulent curls of artichoke, washed down with the finest of wines from the Loire. Ruiz regarded the messenger with narrowed eyes, his fingers raised to his lips and pressed tight together in contemplation. After a pause in which the messenger studied the floor, awaiting dismissal or the flare of rage of which the merchant was on occasion capable, Ruiz nodded twice and thrusting back his chair called for his cloak. If the tale should prove to have substance he would take care to ensure he was among those who greeted this king, for what use wealth if gain could not be made of it. “There are colourful individuals, opulent settings and clashes of personality aplenty. There are thoughtful and level headed characters as well as those who let their tempers get the better of them. There are relationships which work and those that are destined to fail. The result is a hugely satisfying read which leaves this reader, in particular, hoping that there will be another book in this excellent series.” Undiscovered Scotland. Yesterday a link dropped onto my FB author page which, once I’d realised it was a link (several hours and someone’s comment later) took me straight to an article in a German newspaper, featuring the research visit I’d made to Torgau in Saxony just over a year ago. I was travelling in the footsteps of Katharina von Bora, the escaped nun who became Martin Luther’s wife, in order to paint an authentic background to my novel Katharina: Deliverance. Although I can’t read German, and have to rely on the less than idiomatic FB translation, it seems a lovely article and I’m chuffed to bits. For those who can’t, google translate gives the gist! So my thanks to Anja, Ursula and Katrin of Torgau Tourist Information Centre and to Sebastian who wrote the article. 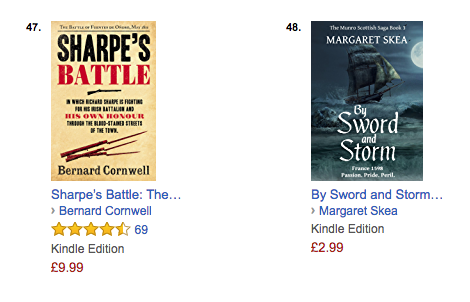 Munro no 3 – By Sword and Storm – will soon be hitting the bookshops (and e-readers). The proof-reader has been through it, but I still need to check anything that needs altered as a result, and I’m in discussion with Corazon and with myself re the cover. Formatter is on standby (at least I hope she is) as is the printer, (ditto). And we’re working on the possibility of some ARCs to be sent as review copies. (There are some technical hitches with those, but hopefully they will be resolved soon, courtesy of the KDP print service, which may solve the problem of getting a small number of print copies without having to re-mortgage the house). In the meantime two Amazon related notifications that some of you might be interested in. The first is an article about Eoin Purcell – Head of Amazon Publishing UK – the publishing wing is distinct from Amazon marketplace. The second is an Amazon Academy day to be held in Newcastle on the 5th June. I was an attendee at a similar event last year in Edinburgh and it was very useful and informative. This time I will be one of the panellists. Oh, and it’s FREE. If you’re within shooting distance of Newcastle (or even if you aren’t) it would be good to see you there. The papers this week have been full of obituaries of Drue Heinz, the lovely lady who gave so generously to support writers in both the US and the UK. I was fortunate enough to be awarded two Hawthornden Fellowships (in 2011 and 2016). It’s impossible to adequately describe the experience, suffice to say they have been two of the most productive writing months of my life and I am immensely grateful for the generosity that made them possible. From mid-February – mid-March 2016 I was privileged to be one of those ‘Fellows’. I arrived on a drizzly Sunday afternoon in February, just as the light was beginning to fail. As I keyed in the code I’d been sent, tall gates swung back allowing me entrance to a long drive curving downwards through woodland carpeted with snowdrops. Beyond the main entrance to the castle is a grassed courtyard, bounded on two sides by the remains of an ancient keep and on the third by a low parapet, providing the only protection from the sheer drop of 100 feet or more to the river below. The inner door opened onto a flagged stone hallway with a welcoming open fire. Later there would be time to examine the coat of arms above the entrance, the commemorative stone plaque on the castle wall and the library, but for now the priority is to find my room and settle in. The writers’ rooms are on the second and garret floors, the latter reached via a steep spiral staircase, so narrow that several folk have to open their cases in the entrance hall and ferry their belongings up by the armload. Each room is different, varying from tiny to very large, but all are comfortable, and have everything we need. I quickly feel at home in mine. Our first meal was in the formal dining room with linen napkins and elaborate place settings, including pewter water goblets. It was also the opportunity to meet the other ‘Fellows’ with whom I would spend the next month. Aside from me (from Ulster, living in Scotland) there was one American, one Dane and three English, all with very different backgrounds, which made for lively and interesting discussions and unexpected insights. Breakfasts and dinners (other than Sundays) are served in the ‘hearth room’, the elm table scarred by centuries of use, the porridge served in pewter bowls. Lunch is delivered to our rooms in Fortnum and Mason baskets, and at night our chat in the drawing room is presided over by near life-size portraits of Aldous Huxley, Jean Cocteau and Truman Capote. There is a sense that work can and must be done here. And work was done, each of us finding our own rhythm, but all I think achieving our self-imposed targets, in between forays into the woods and along the river: ‘thinking’ time in which to process ideas, and to return re-invigorated. My target was 20,000 words of a new novel, for which I had no idea of plot. I came home with a storyboard covered in post-it notes and 23,500+ words of a first draft. For almost 2 weeks there was no central heating, courtesy of a boiler failure, which in February in a 17th century castle is atmospherically chilly, despite the administrator’s best efforts. So I turned my room into a ‘cave’ covering over the windows with double layers of heavy card, the lack of natural light far out-weighed by the increased comfort. And when the sun shone, I worked in the greenhouse in the walled garden. On the last evening someone asked what we each might change when we went home? Imposing a 9-hour rule of silence would be impossible (sadly), but I hope to maintain a daytime embargo on internet use. Would I go back? Like a shot. Here’s the link to the Herald obituary (in which I get a mention). ‘Remember the kid’s rhyme ‘I’m the king of the castle and you’re the dirty wee rascal.’? I can remember shouting it out from the ridge of our garage roof. You can tell I wasn’t the pretty princess type – Slaying the dragon was more my style. 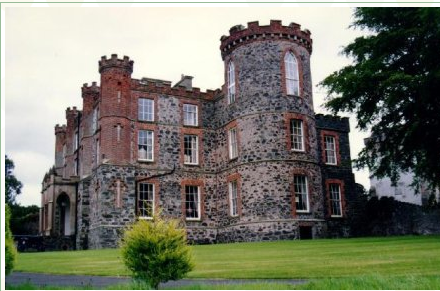 A lovely castle – not really old – built in 1808, but suitably castle-shaped and situated not too far from where we lived, came up for sale. I did try to give them a very good (in my opinion) argument to counter all their quibbles – but somehow the business acumen of a 10-year-old didn’t seem to quite cut it. For the record, I thought the accompanying land could easily have been rented out to some neighbouring farmer to cover the doubled mortgage. They thought more of the difficulties of how to convince the bank to lend them the money in the first place. Why is it parents have forgotten how to dream? Anyway, as you’ll probably realise, they didn’t buy it and my dream remained just that. From time to time we passed through the village where the said castle is, and I could never resist looking down the drive and feeling like a fisherman thinking of the ‘one that got away’. And as children do, couldn’t resist reminding my parents (yet again) of their lack of foresight in passing on the opportunity to live there. A few years ago I had the opportunity to visit another rather lovely little castle, as part of my research for the Munro series of novels. It has a picture postcard, fairytale exterior, and dates from 1625, though sadly much of the interior was remodelled in Victorian times. It is also a very liveable, family-sized castle, and I do hope to use it in my novels when I reach that period. Two books in the Munro series are available Turn of the Tide and A House Divided, no 3, as yet untitled (I really struggle with titles) should be out by February, having been further delayed by Katharina: Deliverance, a novel based on the life of Martin Luther’s wife, timed to coincide with the Luther 500 anniversary on 31st October. The cover art was the first part of the jigsaw that is the release of a new book to be sorted. It took quite a bit of work – on my part to chase down an image of Katharina that could legally be used, and on his to manipulate the images and footer about with colour etc. (I’m not good at envisaging colour without seeing it, so I asked for lots of alternatives, and he was as always, endlessly patient with me.) So here I should give a big cheer for Clifford Hayes http://www.hayesdesign.co.uk – I’m not sure if I’m his most picky client, but I’m probably not his easiest. And one for Sweden – and the National Museum there, which has been sufficiently enlightened to decide to release digital images of 1000s of artworks in their collection into the public domain. All they ask is appropriate attribution. It took a bit of time trawling through to find that they had a copy of Lucas Cranach the Elder’s 1526 portrait of Katharina von Bora, but it was a wahoo moment when I did. It wouldn’t have been my first choice – this one would: a portrait held in the Wartburg in Saxony. But the photo I’d taken on my mobile phone, while good enough for use here, wouldn’t quite have hacked it for the book cover – resolution and what-not. And even if it had been, getting permission to use it, while it would have been straightforward enough, certainly wasn’t economic. So it was at the end of several weeks of searching that I stumbled over the website link to the Nationalmuseum (Stockholm). They hold a version of the same portrait, though the dress isn’t two-coloured – which I rather liked – especially as green is my favourite colour, but, in the circumstances, I could live with that. I also knew I wanted a Wittenberg skyline as the background to the portrait, but that the designer found on the 123RF site, which could be used for a modest fee, so we were all set. Here is the finished cover – and I’m more than happy with it. Job done? Not quite. This is the first of two books about Katharina and the designer wanted to work on both covers simultaneously, which was going to be a significant saving for me, so a no-brainer. However, that meant there was one more image to track down – a suitable picture of Martin Luther, which in my book (no pun intended) meant one in which he didn’t look too old or severe, or ugly, or… Fortunately, one of my reference books had a picture of him on the cover that fitted the bill, and, joy of joys, the Museum in Stockholm had it as well. But if my part in choosing Martin’s portrait was easy, the designer’s part in using it wasn’t. The rather attractive portrait shows Martin with his hair curling around his face in fine wisps. Cutting him out of the background of the portrait without either losing some of the hair, or retaining some of the background was going to be challenging. Finally, after a lot of discussion, we decided to make the background colour of the central section of the second book a version of the background colour of the original portrait. Problem solved. And after two days agonising over a title – always one of my biggest problems, no matter what I’m writing – the cover for Katharina: Fortitude was ready. There was one other issue that needed to be sorted and this is where the scanner comes in. I needed a map of the important places in Saxony for inside the front of both books. Now, I’ve laways loved drawing maps, so it wasn’t a huge problem to produce the map myself, but getting it into a suitable format in terms of reproduction, resolution etc for print was a different matter. I took about 4 hours and many attempts before I was happy with the map – not the layout, but the little illustrations to go with key places that I’d set my heart on. Wittenberg wasn’t a problem, a wee sketch of the Town Church worked well for that, but I did struggle with the Wartburg and with Hartenfels Castle at Torgau. Once I had the map I tried to get a good photo of it, without any shading, but couldn’t, even with assistance from someone with a really good camera. The solution, or at least part one of the solution, was to scan it via one of those all-singing, all-dancing giant photocopier/scanner/printers – the ones that take up half the floor space in an office. Now, I’d drawn the map with a black fineline mapping pen on white paper. When I sent the image to the printers to check it as a precaution, before the formatter dropped it into place, I found that the jpg format the copier had produced wasn’t what was needed. So here’s my third shout-out – for the printer who obligingly altered the file I’d sent into the appropriate format. The final issue was chopping the map in two, so that it went over a double page spread, and that the printer was happy to do for me too. So a huge thank you to the technical guys at Anthony Rowe.